in the Boku global merchant network including, Facebook. This means Facebook users in the Philippines will now be able to use GCASH to purchase game credits on any Facebook game operated by Zynga and Playfish. Zynga games include Farmville, Cafe World, Mafia Wars, Zynga Poker, Treasure Isle. Playfish games include Restaurant City, Pet Society, Hotel City. To purchase game credits using GCASH, simply go to the payment page of any Facebook game operated by Zynga or Playfish then choose Boku/Paymo. 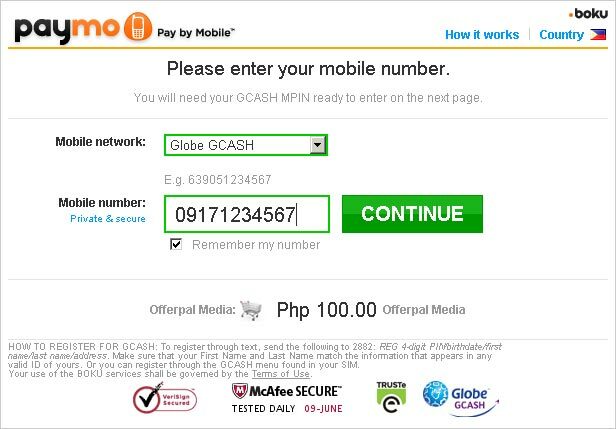 Enter your mobile phone number and GCASH Mpin. Once the transaction has been completed, Globe will send a text message stating the details of the payment. bakit ayaw na sa smart? Sana may Sun cellular din..
why it takes too long to have my pin code? >:( im from philippines.